Modularity has been at the core of Bitwig Studio from the beginning. Devices can be nested, clips are containers, modulators exist everywhere, and practically anything can be dragged anywhere. But with Bitwig Studio 3, we are zooming out so you can push in. We Focused on Technology; You Focus on Sound. The technology powering The Grid is as it should be: working, felt, and transparent so you can focus on the big, sonic picture. Here’s a taste of what we’ve done. All signals are created equal. In The Grid, all signals are interchangeable so any out port can be connected to any in port. While this is rarely the case in other programs, Bitwig Studio has made it so. Try something crazy; you (probably) won’t get electrocuted. Getting more with less cords. For signals that are needed regularly, we have the option of pre-cords. These clickable icons appear beside in ports allowing common connections to be made wirelessly. 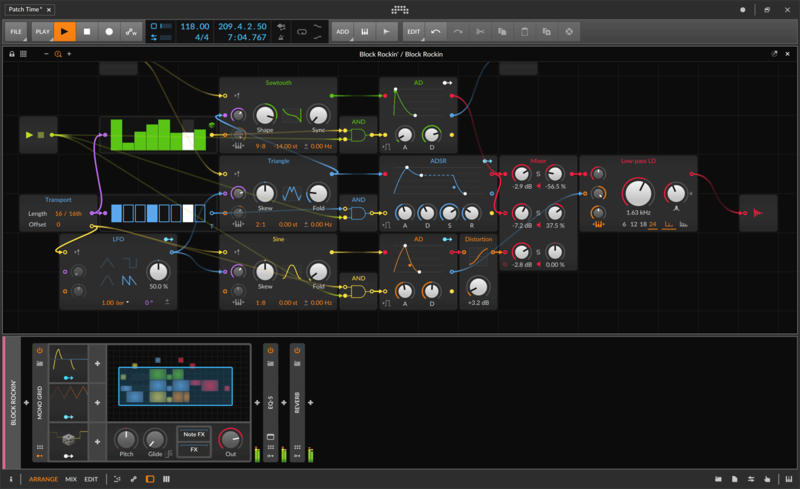 And with The Grid’s quick workflow gestures, new modules can be dropped directly onto ports, automatically wiring them into your patch. Work smart instead of hard. Those are just a few examples of what makes The Grid a special place. And it is all the more special since the technology just works, allowing you to focus on your new sounds. Best of all, this new system is a completely native part of Bitwig Studio, giving you so much more to work with than audio. Grid devices can be nested or layered along with other devices and your plug-ins, and they are controllable from the same Open Controller API. Song position is available as a sample-accurate signal, locking your work in The Grid to your project’s timeline. Draw Arranger or clip-based automation for any parameter in your new grid patches, even in combination with Bitwig Studio’s existing modulators. Modules like envelopes, LFOs, and sequencers all have modulator outputs as well. And just as Bitwig Studio’s modulators can control any parameter in The Grid, any grid signal can be used to modulate child devices. Your hardware modular rig is completely integrated, with dedicated grid modules for sending any control, trigger, or pitch signal as CV Out and receiving any CV In. That's just scratching the surface. And soon, you will be too. Bitwig Studio 3 will be previewed at NAMM (January 2019) and will enter public beta shortly afterwards. Expected release of Bitwig Studio 3 is Q2 2019. Bitwig Studio 3 is free for everyone with an active Upgrade Plan. With sonic possibilities in every direction, The Grid will make creating something new a habit instead of a challenge. Get ready for the next step of our musical evolution, and also yours. Coinciding with our announcement of Bitwig Studio 3, we’d like to take a moment to look back at our perspective on software and how it has informed our journey, up to today and beyond. Learn more about the full feature set of Bitwig Studio here.